Problemen met het lezen van de nieuwsbrief? Lees online. Problems reading this email? Read online. kunst scène, zowel in Vlaanderen als internationaal. de positie, het belang, de waarde, de return. belang van een netwerk en de reflectiemogelijkheid die een residentie biedt. Met de steun van BAM. 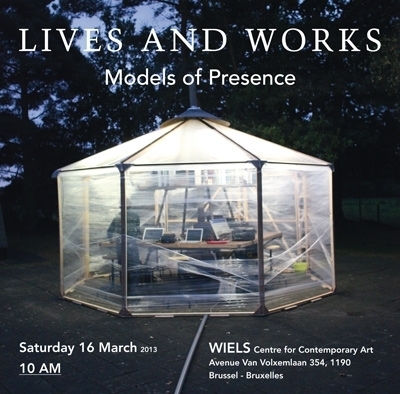 Lives and Works: Models of Presence, examines the role of residences as a platform for networking, production, presentation and inspiration in the current art scene, in Flanders and internationally. This symposium aims to highlight different aspects of a complex operation: the position, the importance, the value, the output. In addition to this, we shall also discuss the multiplicity and complexity of an artist-inresidence organization, the regional flow, the importance of a network and the reflectivity for art practice provided by residences. Lives and Works: Models of Presence, an initiative of Frans Masereel Centrum, AIR Antwerpen, FLACC, Lokaal 01 and Wiels Centre for Contemporary Art, arose from the need for critical comment on current policy trends for residencies and from the need to render these trends and their effects/operations visible to a wider audience. With the support of BAM. Met de steun van de Vlaamse Gemeenschap, Provincie Limburg en Stad Genk. FLACC is een structurele partner van het Platform Limburg Beeldende Kunsten. With the support of the Flemish community, the Province of Limburg and the City of Genk. FLACC is a structural partner of the Platform Limburg Beeldende Kunsten.